To ensure that this presentation would be an easy read, I used the 131 minute March 12, 1942 cutting continuity as a guide. I then completely rewrote using descriptions from the original October 7, 1941 shooting script. To this end I not only used the applicable descriptive material from script but, because the screenplay took its descriptions – almost word for word – directly from the Tarkington Novel, I went back to the book for whatever additional material I needed. For the film’s final scene, which is not in the script or the book, I took the descriptions from various Welles interviews in which he described the scene in great detail. In the process this ‘reconstruction’ became a more complex and, I think, fulfilling read due to Welles detailed descriptions of actor’s instructions and in some cases even their characters’ thoughts. Using frame blowups from the released version as well as stills and even existing frames as well as story boards for missing scenes—in a few cases doctoring photos to match the continuity descriptions—I hoped to provide the reader with a sense of the physical look of the film. When a cut was made to an existing scene, I reused similar shots from the existing sections to conform the scene to how it existed in the 131 minute version. For re-shot scenes, since the costumes and the sets were the same, I re-arranged the frames to—as best as possible—duplicate the original version. For other scenes I found photographs that matched the continuity descriptions and used them as best I could. In a few cases the image may not be an exact duplicate of the description but I hope you will forgive this as it was impossible to do otherwise. Regarding the deletions, for multiple angle scenes I made sure there was a frame for each angle and for the single take scenes I tried my best to to use frames as the script descriptions required. The reconstruction is broken down into seven parts with each part corresponding to each (A&B) reel from the 131 minute version; seven reels in all. Also a single web page would never been able to accommodate so much illustrative material. At appropriate points on each of these “reels” there are labels with the names of the music cues from the original music soundtrack CD. I have included the music cut from the film. All you need do is click on the label to hear this music . To hear the music in the release version you will need to purchase the CD but I have indicated here where that music belongs. (It is a must for Herrmann’s fans as, of all his scores, this is his most varied in terms of mood.) Thus, for the first time much of Herrmann’s cut music can be heard with the images for which they were created. 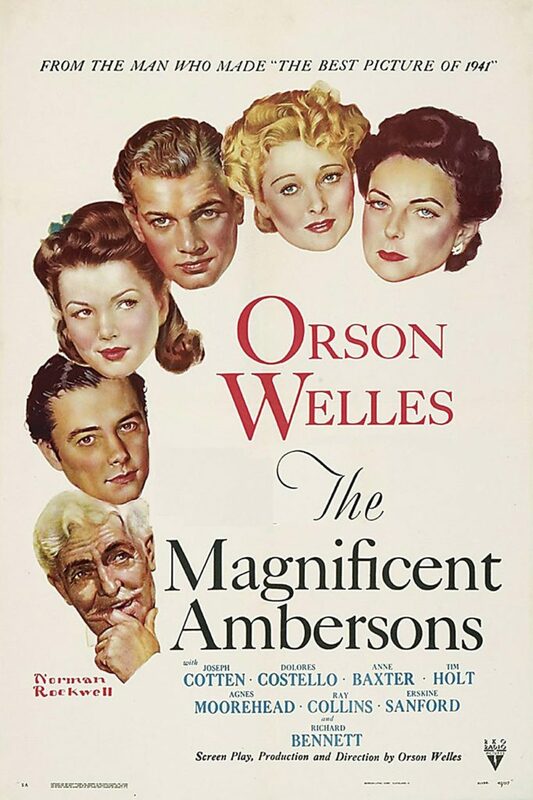 It is my hope that this music will provide the reader with the mood and feel Welles and Herrmann tried to convey in the original cut of THE MAGNIFICENT AMBERSONS as Herrmann’s music was indispensable to the film Welles made. Finally, since listening to “No News: or, What Killed The Dog” is instrumental in appreciating the overall effect of the Boarding House ending, there is a tab which when pressed will bring up the original 1906 recording. I would also like to thank Brian Rose for providing several missing frames. Since this presentation involves an immense amount of information please, understand that each section (or reel) will take a bit of time to load. So, please, be patient. To view THE COMPLETE MAGNIFICENT AMBERSONS press the reel # below or the arrow beside the listing for this page. Film Frames are (c) 1942 RKO Pictures.